Designed for use with pedestals and saddles, this dual purpose Crotch Anchor, in conjunction with the Knee Straps and Contoured Thigh Straps, creates the Three-Point, Double-Strap System. Double sets of rounded, heavy-duty, nickel-plated sliders are used for a smooth pull when tightening straps. It can be converted for use in a Single Strap System by releasing the knee straps and attaching the thigh straps directly to the Crotch Anchor’s metal sliders. 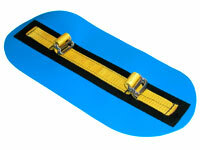 The Crotch Anchor can also be used with 1" webbing straps. The Small Double Crotch Anchor is designed for narrow and confined spaces, such as the bow position in tandem boats. 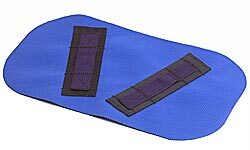 It can be used with either 1&quot or 2" thigh straps. The Large Double Crotch Anchor is ideal for the stern position in a tandem boat, solo position in a tandem with seats, or in tripping boats equipped with kneeling thwarts. 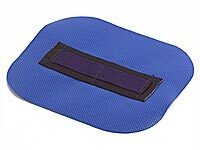 It can be used with 1" or 2" thigh straps. Attachment points are angled to provide closer strap placement on the thighs.